Once upon a time (two months ago) I decided Tuesday would be quote day here at Blissful Roots. I did a whole post, and then made a printable quote at the end. Well, that proved to be a lot of work! I love the quote idea however, so I've decided to devote my entire Tuesday posts to just printable quotes. 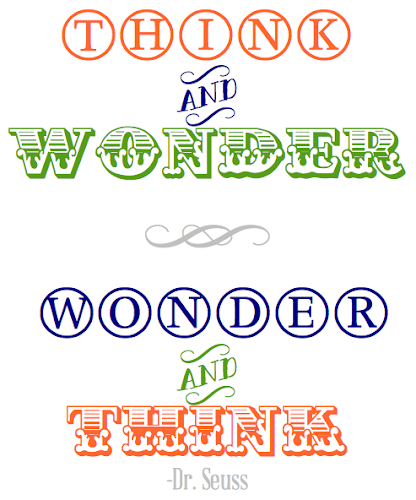 Today, in honor of Dr. Seuss' birthday (March 2) I have three printable quotes. I've loved Dr. Seuss for as long as I can remember. Who doesn't love Dr. Seuss? 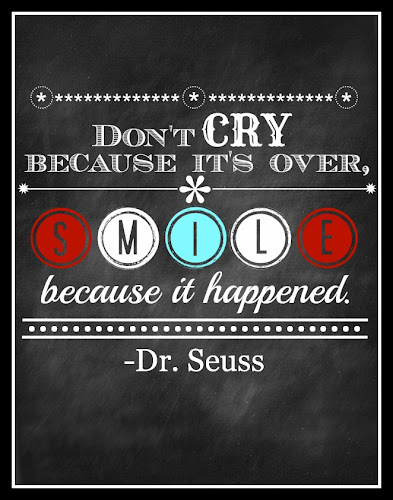 I loved his books when I was little, I read his books all the time as a first grade teacher, and Dr. Seuss even helped me earn a partial scholarship during my college days. There was a part on the scholarship application where you were asked to write a short essay on who you would choose to meet if you could meet anyone in the world (living or not). I chose Dr. Seuss. I don't remember anything I wrote in my essay, but I remember being awfully glad I chose him. Thanks, Dr. Seuss! I love this quote because I have three little boys, and I often need reminded that they're people just like me. They maybe smaller, but they're really no different than me. They get frustrated- so do I. They have bad days- so do I. They get cranky sometimes- so do I. Every time I think of this quote, I remember I need to be a bit more patient and understanding. I had a hard time picking just three of Dr. Seuss' quotes (there are so many great ones to choose from! ), but these are a few of my favorites. If you're interested in more of his quotes, you can click here. Simply click on the image of each quote to print. Seussisms are just the best!! Love your choice of fonts. very fitting. Thank you so much for stopping by and your comment. 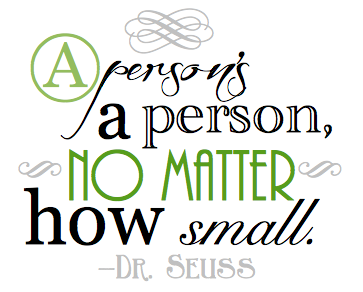 I could quote Dr. Seuss all day long. Have a great day! Very Cute. I just pinned these. Thanks! Hi, Kristina! Thanks so much for visiting today and for your kind comment and pin. So glad you liked them! Brooke....these are SO cute. Please consider linking them up to my weekend link party this weekend. It opens on Friday morning at www.thepatrioticpam.com. I know many of my readers that would also love these. I am your newest follower! I'd love to link up to your party! Thanks so much for visiting and being a new follower. I'm on my way over the your site now. Thanks again! Brooke....this was a feature on my link party this week. Please got to The Patriotic Pam and grab the feature button. Congrats. These are lovely! Thank you so much for sharing! Thank you, SallyAnne for taking the time to visit and comment. I'm so glad you liked them. Enjoy your weekend! I love these sayings and fonts! I especially like how you formatted each saying differently. Thanks for sharing. I'll definitely be printing these and finding a place for one or more. I'm so glad you can use some of these, Beth! Thanks so much for visiting, come back soon! Thanks so much for the feature, Ginger!! I love visiting your site. Thanks so much for stopping by Blissful Roots. Come by any time! Thanks, Ruthie! I'll be there. These are great, pinning! Thanks so much! I really love reading Dr. Seuss quotes. They are simply brilliant, wonderful and meaningful. Thanks for sharing! I love all three and I need to print and hang the first. I'm finding that when I take my boys somewhere fun for them, like the children's museum, there are always tears when it's time to go. I'd love to hang the first in their room where we can refer to it, and remember that we had a great time [instead of being SO sad that it's over]. Thank you!